Illuminate any room with gentle and warm lighting! Illuminate any room with the gentle, warm and multi-colored LED glow cube! Personalize your color choice or opt to watch it change between 16 different colors thanks to the included remote control. Features 4 different color change modes: Flash, Strobe, Fade and Smooth. Perfect in a sensory stimulation environment or as a fun stool or end table in any setting. 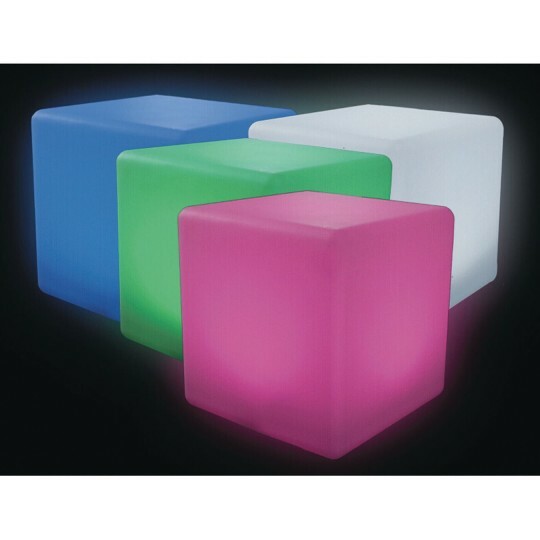 The LED cube is rechargeable, allowing for wire-free operation for up to 60 hours (on lowest brightness setting), 16 hours (on medium brightness) or 10 hours (on full brightness). The cube charges in just 5-6 hours with the included AD/DC adaptor. Remote control requires 1 "CR2025" battery, included. Measures 16" x 16".